Connected stories tell about the time when animals and people lived together as friends and neighbors in the Igbo city of Eziama. Ikeogu Oke is one of the most revered Nigerian poets and short story writers. His works have been published in the United States, Nigeria, Europe, India and South Africa. He has also performed his poems and short stories at various forums in the United States and Nigeria. He has published four books of poetry: Where I was Born (2002), Salutes Without Guns (2009), In the Wings of Waiting (2012), Song of Success (2012). 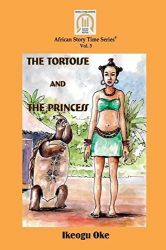 The Lion and the Monkey (2014), and The Tortoise and the Princess (2015) are his recent short stories. The Tortoise and the Princess, a children’s book published in paperback, has 69 pages. It is divided into two parts. Part 1 has eleven stories and Part 2 has nine stories which are connected to Part 1. Each chapter has a theme/moral lesson that children can apply to real life situations. They will learn the consequences of greed, betrayal, and obstinacy. They will also learn the importance of being respectful and avoiding retaliation or revenge. Adults too can enjoy the stories in this book and learn from them. Children can read the book like one continuous, long story or teachers can read a chapter a day. Reading by chapters will keep children in suspense and make them clamor for more. The book contains musical scores of the songs used in the stories. The scores will help children learn the music and they will be excited to sing along as they read the stories or listen to an adult read to them. The glossary of terms will help children understand what is going on without resorting to a dictionary. In the past, stories were told by the fire-side. Children today can get the same knowledge, moral lessons, and excitement when they read the book or when it is read to them. The tortoise is a trickster in Igbo society and in many other parts of Africa. The princess is another familiar trope. This princess is a beautiful young girl who is choosy when it comes to marriage. Her reluctance worries her father King Ezeọgọ. After much discussion, she tells her father that she will marry the man who brings her an elephant that she can ride whenever she likes. Tortoise overhears this conversation and sets his plan in motion. He will take his friend Elephant as gift to the Princess without alerting Elephant. His goal is revenge. He wants to get back at the Princess for an earlier insult. The story unfolds with an appropriate and satisfying ending. Ikeogu Oke gives a beautiful scenario about King Ezeọgọ and his people early in the book. The Igbo kingdom of Eziama is inhabited both by animals and humans. The humane king rules his kingdom well. The animals and humans interact and live together peacefully. The king averts a big fight between Leopard and Lion and eventually both animals become friends and neighbors. This example shows that the king is a good leader. He makes wise decisions, unites his people, and helps them to live in peace with one another. In return, they love and respect him. This book is highly recommended for children in elementary school, the formative years when children start learning about themselves and the world in which they live. Each chapter has a beautiful illustration representing the story except the chapter entitled “A Changed Princess.” Children can visualize the princess or paint their own picture of a changed princess. Over all, Ikeogu Oke has done a good job. The book is a great contribution to children’s literature and is highly recommended.